A Visio drawing can contain any number of pages, and each page can have its own dimensions, measurement units, and other characteristics. In addition, the on-screen drawing page can have different dimensions from the physical printer page. Compress a large drawing to fit on a smaller sheet of paper. Print a drawing on a very large sheet of paper. Print a drawing across multiple sheets of paper. Indeed, Visio gives you remarkable flexibility in setting page attributes that are useful for virtually any diagram type and any form of printed or electronic output. Foreground pages contain the active drawing content and are typically the pages that are printed or published in some form. Background pages contain page elements that can appear on one or more pages but cannot be selected unless you are viewing the background page. By associating a background page with a foreground page, all text and graphics on the background page appear on the foreground page. One common use for background pages is to add consistent borders or titles to a set of foreground pages. Another is to include the company logo, a legal notice, or any other graphic or text on multiple pages. 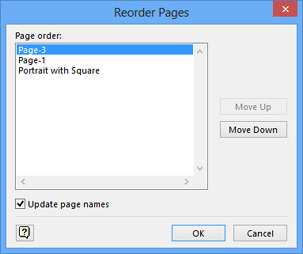 In this exercise, you’ll add, delete, and reorder pages, as well as change various page settings. You’ll also use the new Visio 2013 duplicate page feature. You will work with background pages in the next exercise. SET UP Click the File tab, and then click New. Click Categories, click General, and then double-click the Basic Diagram thumbnail to create a new drawing. Save the drawing as Pages and Page Setup. Then follow the steps. On the Insert tab, in the Pages group, click the lower part of the New Page button, and then click the Blank Page button. Visio adds a page called Page-2. Notice that you can also add a background page or duplicate the current page from the same drop-down menu. Next you’ll change some of the attributes of Page-2 using convenient new features of Visio 2013. On the Design tab, in the Page Setup group, click the Orientation button, and then click Portrait. Clicking this button changes the orientation of both the drawing page and the printer page. 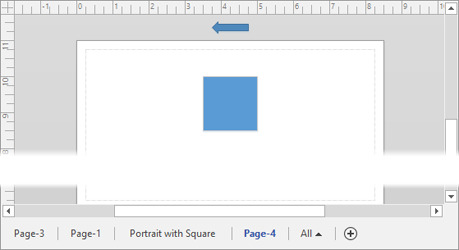 Drag a Square from the Basic Shapes stencil onto the top edge of the page so that part of it is on the page and part is on the canvas. Because the Visio 2013 Auto Size feature is on by default in this template, as it is in many others, Visio added a page for you. The dashed line is the boundary between tiles, each of which represents the portion of the drawing page that will print on a single physical page. Drag the square down so it is below the dashed line. Visio removes the added page because it is no longer needed. You can turn off the Auto Size feature if you want to use the drawing canvas to store shapes temporarily that you don’t want to be on the drawing page. On the Design tab, in the Page Setup group, click the Auto Size button, which removes the illumination from the Auto Size button. The Auto Size option is applied per page. Consequently, changing the setting for the current page does not affect other pages. In the Shapes window, click Arrow Shapes, and then drag a Simple Arrow onto the canvas just above the page. The arrow remains on the canvas and Visio does not expand the drawing page. Items on the drawing canvas but not on the drawing page do not print. Click the Insert Page button below the drawing window to add a new page. When you added a page in step 1, the new page had landscape orientation; however, this time the new page has portrait orientation. The difference demonstrates an important point: when you add a page, Visio copies all of the characteristics of the active page. Consequently, if the pages in your drawing have different attributes, be sure to activate a page with the desired attributes before adding a new page. You’ve now used several buttons in the Orientation group on the Design tab that simplify some page-related functions. There are times, however, when you need to make more sophisticated changes to page attributes. The Page Setup dialog box, which will be familiar to users of previous Visio versions, is still available for that purpose. On the Design tab, in the Page Setup group, click the Auto Size button. This action turns Auto Size behavior back on for this page. Right-click the page name tab for Page-3, and click Page Setup. The Page Setup dialog box opens to the Page Properties tab. In addition to selecting the page type and changing the page name, you can assign a background page (refer to the next exercise) and select from a large number of measurement units. Be sure to notice the scroll bar in the Measurement units menu—you have a total of 20 choices. If you change the measurement units, the result is visible in the rulers on the top and left of the drawing page. 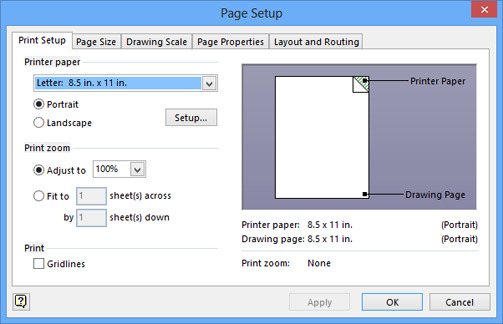 In the Page Setup dialog box, click the Print Setup tab. 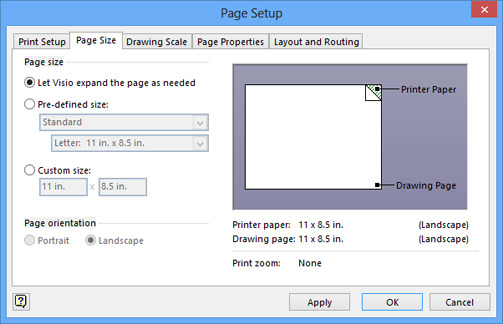 You use the options on the Print Setup tab primarily to affect the size and layout of the physical page, although the zoom settings on this tab also affect the drawing page size. Printer paper Choose the paper size for your desired printer. Most US Units templates default to letter-sized paper as shown in the previous graphic. Metric templates typically default to A4. Regardless of the default, there is a long list of alternate, predefined paper sizes available in the list at the top of this section. You can also select Portrait or Landscape orientation. The Setup button opens the printer setup dialog box for the current printer. Print zoom Adjust to 100% is the default zoom for many templates, but you can select a different zoom level if you want your drawing to print larger or smaller than normal. Choosing a zoom setting greater than 100% causes your drawing to be split across multiple sheets of paper; choosing a setting less than 100% scales your drawing down to fit onto a portion of the printer page. Fit To Provides an alternate way to scale your drawing for printing. Print The single setting in this section includes or excludes gridlines from printed output. The default in most templates is to exclude gridlines. In the Printer paper section, click Landscape. The preview section reflects your choice. 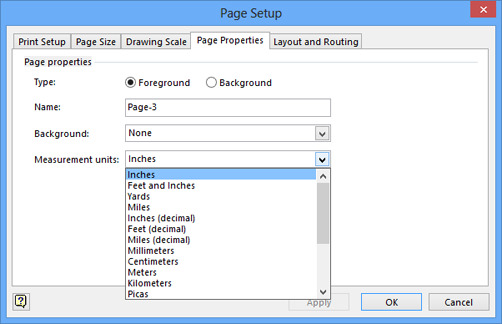 In the Page Setup dialog box, click the Page Size tab. You use the Page Size tab to change attributes of the drawing page; changes you make on this tab do not directly affect the printed page. Page size The first option in this section enables the dynamic Auto Size behavior you used in steps 3 through 5. As an alternative, the second and third options let you set a fixed page size, either from a list of preset sizes or by typing specific dimensions. Page orientation The options in this section are only active if you choose Pre-defined size or Custom size in the Page size section. You can use these options to set a different orientation for the physical page than the one that is set for the drawing page. Click OK. The dialog box closes and Page-3 now has landscape orientation. Double-click the page name tab for Page-2 (not Page-3), type Portrait with Square, and then press Enter. As you saw in step 10, you can change the page name on the Page Properties tab in the Page Setup dialog box, but double-clicking the page name tab is usually more convenient. In addition to changing page names, you can also change the sequence of pages in a drawing. Drag the page name tab for Page-3 to before Page-1. As you drag the page name tab, the cursor displays a page icon, and a black down arrow points to the junctions between pages. When you release the mouse button, the page tabs reflect the new page sequence. Dragging page name tabs is an easy way to resequence pages when the destination tab location for your page is visible. However, if your diagram has a lot of pages and the destination tab is not visible, there is a simple alternative: right-click any page name tab and select Reorder Pages. In the Reorder Pages dialog box that opens (shown in the following graphic), use the Move Up or Move Down buttons. Right-click the Portrait with Square page name tab and then click Duplicate. Visio creates a new page that is an exact copy of the source page. Duplicating a page and all of its contents is a long-desired feature that is new in Visio 2013. CLEAN UP Save your changes to the Pages and Page Setup drawing, and then close it. KEYBOARD SHORTCUT Visio provides two convenient shortcuts for navigating back and forth among the foreground pages in your drawing: Ctrl+Page Up and Ctrl+Page Down.